What we have with Hip is a what Greil Marcus has been attempting to for decades, which is write a coherent narrative of the margins of American culture, descendants of slaves and the children of immigrant parents, coalesced in ways in which each other's style and manner intermingled even if the respective races did not. The grace moment in history is that some wonderful things emerged from all this borrowing, posturing and tension, the jazz, rock and roll and a genuine American literary vernaculary; the tragedy is that it took generations of racisim and violence to produce the historical conditions for these vital arts to emerge. The question of hip furnishes the theme that brings Leland's sources together--what emerges is the story of two races that cannot live together and cannot be apart. 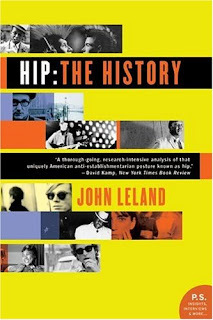 Leland, a reporter for the New York Times, has done his research and brings together the expected doses of cultural anthropology, literature and, of course, music to bear on this sweeping, if unsettled account as to what "hip" is and how it appears to have developed over time. Most importantly he concentrates on the lopsided relationship between black and white, each group borrowing each other's culture and suiting them for their respective needs; in the case of black Americans, rising from a slavery as free people in a racist environment, hip was an an ironic manner, a mode of regarding their existence on the offbeat, a way to keep the put upon psyche within a measure of equilibrium. For the younger white hipsters, in love black music and style, it was an attempt to gain knowledge, authenticity and personal legitimacy through a source that was Other than what a generation felt was their over-privileged and pampered class. Leland's range is admirable and does a remarkable job of advancing his thesis--that the framework of what we consider hip is a way in which both races eye other warily--and is sensitive to the fact that for all the attempts of white artists and their followers to cultivate their own good style from their black influences, the white hipsters is never far from black face minstrelsy. For all the appropriation,experimentation, and varied perversions of black art that has emerged over the decades, there are only a few men and women who've attained the stature of their African American heroes, people who, themselves, were the few among the many.